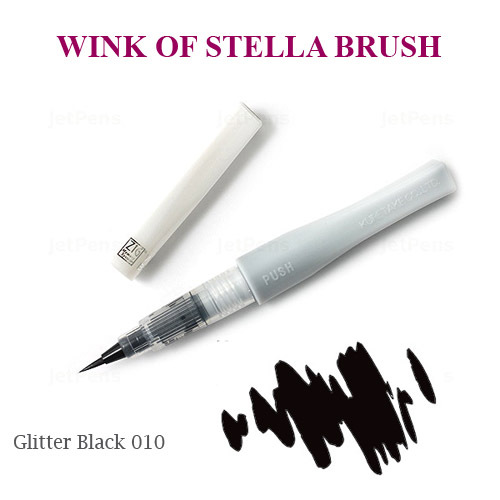 Wink of Stella Glitter Brush acts just like a fine paint brush, with a nylon brush tip that can produce thick or thin lines of glitter, allowing artistic freedom. They are perfect for writing, adding controlled glitter, and stamped projects. Glitter Brushes come in an assortment of colors, from black, white and silver, to blue, pink, and yellow. Create handcrafted personal cards, accent pictures in a scrapbook, trace lettering or add your own, and add sparkle to any project. Glitter brushes work best on paper products and use a water-based pigment. The pigment is photo-safe, acid free, light-fast, odorless, and xylene free.